The weekly ‘Talk and Trade’ at Melbourne’s Blockchain Centre is always an interesting meet-up with astute attendees. 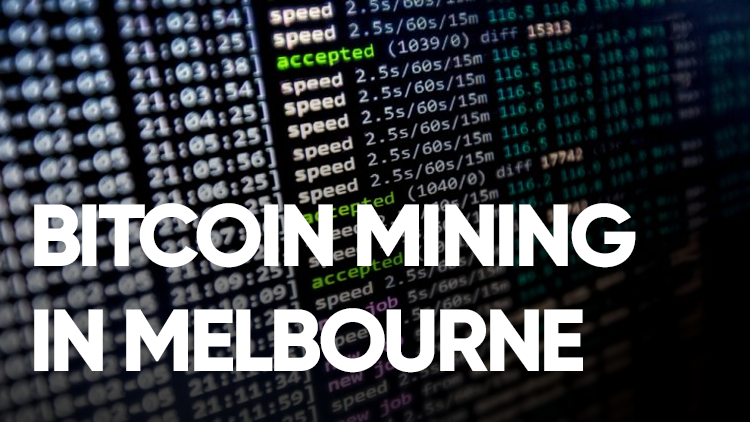 Serg Tsimidanov is certainly one of them, having recently designed, developed and launched a commercial cryptocurrency mining facility in Melbourne’s northern suburbs. Serg is one of the directors of CoinMineSpace who have a unique business model. In this Q&A he talks about their offer to investors and the current Bitcoin mining landscape including equipment, facilities and competition. What was your background and experience before setting up this Bitcoin mining operation? Like many other IT guys, I’ve been selling computers for quite some time. Since 2001 in fact. I am originally from Ukraine and then moved here to Melbourne six years ago. I have some really good contacts in China for importing various computer parts. Last year, myself and a friend of mine decided it was the right time to start a new IT project. He has plenty of experience importing goods from overseas, especially China where he has a lot of contacts. 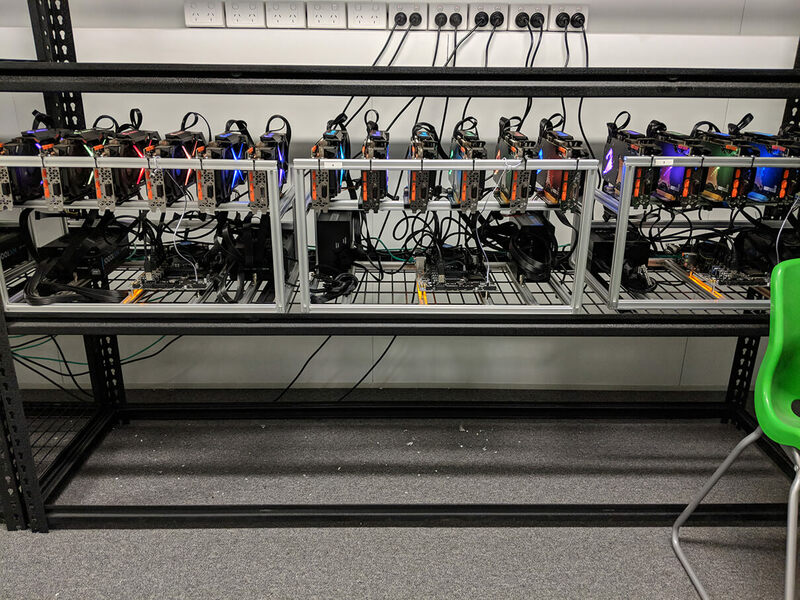 So in 2017 when cryptocurrency started to heat up a little bit we decided to jump in, but instead of trading it which seemed quite risky, we asked why not build a physical cryptocurrency mine here in Australia? The main thing that we were looking for was a good power rate, because otherwise it wouldn’t make any sense moving in here. So we looked right around the country before finding this facility in Melbourne. It has a very low power rate of around 14.2c per kilowatt + GST. That includes maintenance fees and everything. We found this place, calculated everything and were confident we could do it. The USD rate was a little bit over 10c and that is a profitable level used in the US and some other countries. We have good contacts in China, we understand how to choose the right equipment and we have good people in Australia and overseas who are helping us maintain the equipment. To build software to not only get it up and running but also to maintain and run it the most efficient way. So the timeline for setting it up – that was late last year? We found this place in November 2017. We put some miners here in November but they were heating up this whole warehouse very fast. So we decided we needed to change it. We needed to make it the proper way. So that’s why we built a specially designed server room. That was ready late-January, then February/March we started to have more and more units. 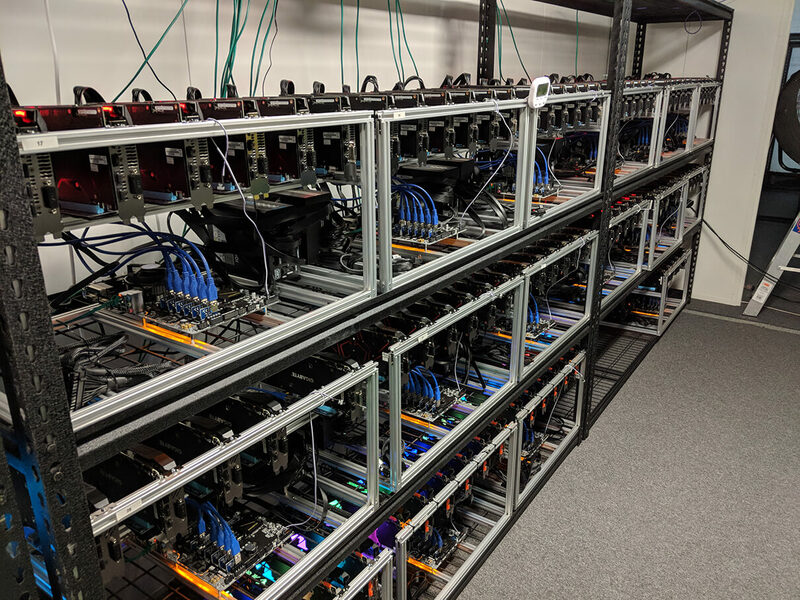 Now we we have more than 100 units – S9s, Baikals and rigs with 6 to 9 GPUs each. So this property is leased? Yes for 3 years and we can do another 3 years if needed. We have been very careful with our money and tried to make it a lean start-up as much as possible. Just to prove to ourselves that it’s going to work. We were pretty sure that it would. We knew that less than 50 units would not be profitable. We’d be spending too much on rent and power and so on. What is the ultimate goal or roadmap? You’ve been up and running for 6 to 8 months, so what happens from here? Well the thing is that we reached the milestone exactly at the time Bitcoin started to fall to $5500 USD but we didn’t stop it because to be honest the cost that we get a Bitcoin now is less than $5000. So we were still running and stacking all of our Bitcoins while bootstrapping all of our expenses ourselves. Paying for rent and power and just waiting. So now when Bitcoin is in a slightly better position we decided that it’s time to expand our mine and we can do that about four times what we have currently. So now we have 700 terahash per second and with this power that we have here we can extend it up to to four times more. So from 700TH/s+ overall speed now to approximately 3,000TH/s or 3PH/s. So you are currently producing or mining Bitcoins at less than $5000 USD. How much has that fluctuated throughout the year? The pay rate goes down, but there are more units and more equipment coming up and we have great relationships with companies getting ready to launch new equipment which will be much much better than the existing equipment. At the same time because we have excellent contacts in China and Russia, guys that are willing to take our second-hand equipment, we will probably get rid of that and get that new equipment. The goal is to grow this mine to 3000 terahash per second which would be reasonable and that would decrease the cost of each Bitcoin mined by us from around $4600 USD down to approximately $3800. That would be much better for us, but only if we can increase it two, three or even four times from where we currently are. That is why we have gone ahead with this investment offer. Why not invite other people to get on board with us? Not instead of us, not selling them something, but actually with us. With guarantees from us because basically we’ll be in charge of the mining instead of having them decide. We can take their headache away. So what is the offer then? Because it’s not quite mining as a service, or colocation, it is something a bit different? There are several options on the general market. If you decide to mine you can buy mining equipment and try to do that from home. Everybody knows that is not safe, I mean anything can happen. If you choose the wrong PSU (Power Supply Unit) for your mining it starts to heat up the room very fast. If you do something wrong technically it can literally burn down your house. Another thing is you can buy equipment and co-locate it. Put it in a server room somewhere else. There are many facilities offering that kind of service, but to be honest if you count everything you will understand that you will pay all of your profit in renting that facility. And keep in mind you are just renting a socket and a place. You will still need to understand what to mine, how to choose between algorithms, equipment and mining pools. So you still have lots to do by yourself. Another thing is sometimes people decide to trade, but that’s a very specialised skill. So what we’re talking about here is an opportunity to be a part of mining and get a much lower price than the market price of Bitcoin. That’s the main point of our offer. So let’s say you can buy Bitcoin for $7000 or whatever it is today, but if it goes down to $6500 you lose $500 per Bitcoin. But what we guarantee is whatever you invested, we pay you back in Bitcoins in a period of 12 to 18 months because we let ourselves have some room in case anything goes wrong. So we pay you back in Bitcoin at the price of $5000 USD for your investment. So it means if you invest $10000 USD with us, which is the minimum we accept, you will get two Bitcoins guaranteed in your wallet within 12 to 18 months. That is paid in monthly instalments. So what is the criteria for whether the full Bitcoin payback period is 12 months or 18? It will all depend on our internal management because if it will be more efficient we will be happy to pay you faster instead of taking a risk on what may happen later. Or if it goes slower than we will pay you in equal fractions of what you expect each month. So it doesn’t mean that in 12 or 18 months time we suddenly pay you in full. We actually start paying your Bitcoin in 30 days and continue to do that each month. We’re not taking this money to fund our current equipment, we are using it to buy new equipment because we want to reduce our expenses here. So an investor is repaid in monthly instalments which may be 12 monthly instalments or up to 18, but either way at the end of that contract period, for every $5000 USD you put in you have one Bitcoin? Yes and then the equipment stays with us. So at the end of the contract the investor has their Bitcoin and you have the equipment to do whatever you want with? Yes and again it is understood that we make maybe $300 per Bitcoin, but keep in mind that we are trying to reduce our costs so that doesn’t really affect the investor. They just get their Bitcoin at $5000 USD. So during the period of the contract, how does the investor know whether they are on that 12 month ‘repayment’ plan which is best case scenario, or 18 months? What visibility do they have there? So we put 18 months on the contract, but if things go well with our management and so on they we will increase the rate to fast-track it to 12 months. Then once the investor has their full Bitcoin in their wallet, that is the end of things. So how much investment are you chasing and who do you think would be the ideal investor? So we put a limit on the investment we are looking for at $500,00 USD. We use USD because it’s easier to use that as an exchange rate. We buy all equipment in USD so we decided to stick with that. The reason for the $500,000 USD is we have a limited space available for new equipment. Plus we have some securities right now in the manner of Bitcoin, equipment and money which we can use to cover $500,000 USD. Anything more would be too risky. So you have reserves for $500,000 USD? Yes we have reserves in Bitcoins, equipment and cash so if anything happened we pay Bitcoin back to investors and that’s it. But we do also have reserves in equipment which still has some value, especially GPUs which can be sold on the second hand market. And of course we do have some finances just in case things started going wrong. So in terms of the funding you’re looking for, did you consider just borrowing the money? I’m not sure what banks would say as they’re often not very crypto-friendly, but did you try them? We tried but that would have meant us taking more risk on the volatility of the market. It means we would have had to pay back in fiat currency, which is a possibility, then that is an extra risk for us. So that’s the first reason. The second reason was none of the banks consider this a real business. It’s not an agricultural business, it’s not a manufacturing business, they just don’t believe in it. They’re not big fans of crypto to begin with are they? They don’t consider what we do as being secure so they’re not interested. I did have a look at your website and I know it’s still under development, but did you consider listing information on the company directors so that potential investors know who is behind it? We will. We just launched the site a couple of weeks ago so we are still improving that and like you said putting a list of directors up. Also some photos of how we work here and how we built it. The website is purely to let everybody know what we do and let them know about our offer. Because we are here in Melbourne we are not hiding any information. It is easy for you to give us a call and come see for yourself. It’s not an ICO or cloud mining or anything like that. We have everything here and it’s better to come and see for yourself. 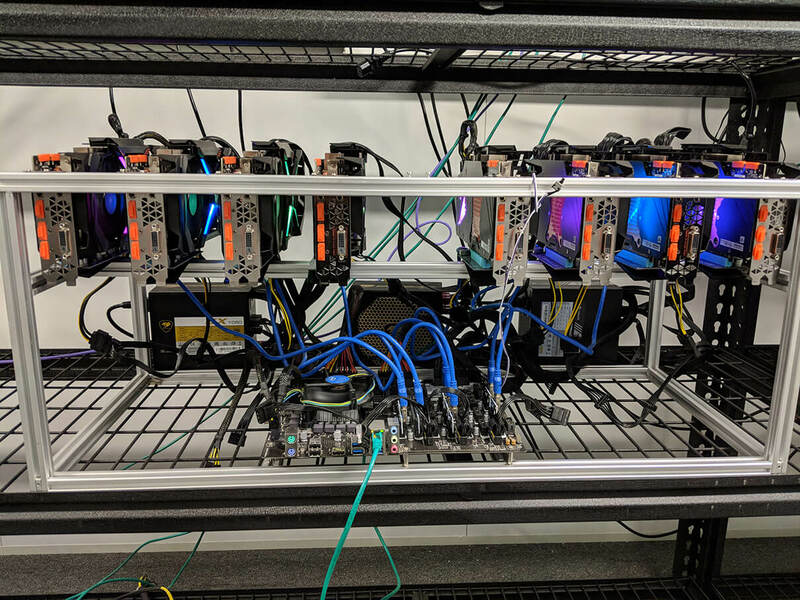 So the types of mining equipment that you have – you’re running both ASICs and GPUs here? Yes. We are running ASIC S9s, the latest ones are 14 terahash per second. We have Baikals which is a very nice bit of equipment that is now a bit cheaper. Again this is something that we’ll be interested in getting more of as they can mine on five algorithms and the new models can mine on seven algorithms. That’s very important because you will have some flexibility to choose between algorithms and cryptocurrencies and that’s the beauty and the science and the art of this business. But that’s mainly for your team though isn’t it? Because the investor is paid in Bitcoin so really what you do with the equipment is your own business. Yes the investor will get a Bitcoin as the major cryptocurrency and something that is simple and basic. Every investor can understand that, whereas other cryptocurrencies get complicated. Everything we mine gets converted into Bitcoin. By the end of the month we have changed whether it’s Zcash or Decred or whatever, we pay back in Bitcoin. Do you think down the track you will offer any altcoins direct to investors? Do you have any idea of the tax implications here? Because if people are receiving 1/18th of a Bitcoin for 18 months, how would that be viewed from a tax perspective? Well you would have to pay tax on profit. The only portion that is taxable is the amount above $5000 USD. So you’re kind of buying a futures of Bitcoin. The tax will be similar to trading a share on the market. I ask because one of the things that came to mind is for Capital Gains Tax, if you have held the asset for more than a year you get the 50% discount. So I wonder for an investor here do they own the Bitcoin when they sign the agreement with you guys, or is it not until they receive each instalment? Whatever they receive within the financial year, that’s what they earn. We are putting a disclaimer in this part as we’re not giving financial advice. It is the investor’s obligation to get financial and legal advice and that’s why I haven’t sent you the contract yet. There are many things we are still working through and the investor may want to customise. They might say they’ve spoken to their legal advisor and need to add this, this and this. So in this case we’d consider that to make it a little bit easier for the investor. I understand in places like China they might be paying 3 or 4 cents for power, is that right? And if so, how do you compete against the big boys when they’ve got it so good? In other countries it can be too risky. We do have some mining equipment in Russia as well and electricity is really cheap there. I think it’s around 4 or 5 cents per kilowatt now, but the thing is you still have risk with regulation. It’s not in Australia so how are you going to make sure it’s still there and still mining? The whole system is too complicated for an ordinary investor who doesn’t understand all of the details of cryptomining, so that’s why we’re here to again say ‘hey, this is our facility and our equipment and how we’ve spent the money’. We’re not really competing with them because they may lose all of their equipment tomorrow. We know for certain that with the power rates we have here, we’re definitely making money. It is profitable. If someone else is making more money, that’s OK.
Electricity you can’t really compete on directly with China and Russia, but you’ve done some other stuff here that would be equal to best-practice globally? We have built a management system and software that helps us monitor everything 24/7. We also have staff locally and offshore to help us do that. In data centres, they do have some physical presence there all the time of highly trained engineers to make sure everything is working right. In our case we have done things in a simpler way. So that’s why we have cut some costs in a few areas. And the facility itself is not too fancy so we do save some money on rent. Sometimes overseas they pay less for electricity but they do dodgy work in terms of the facility or infrastructure. Every piece of equipment is quite fragile but is working 24/7, so you need to know about everything like the dust, when to stop and maintain it, and so on. Some people overseas don’t quite realise the whole picture. Yes, electricity is cheap but maybe the equipment breaks down after two or three months. So we tried to choose our own way here. And it makes profit. We don’t know everything that is happening overseas, but we do know it’s possible to make money in Australia. We are profitable. Speaking of equipment and maintenance, I understand some of the most expensive equipment you purchased has been the best investment? Yes. It makes a big difference if you don’t try to cut corners and instead just buy the best equipment Anything to do with electricity like PSU’s and cables you should really buy the best quality. Because otherwise any issues you have with that can turn out to be a huge loss. Even a fire is possible. How do you handle security in terms of this physical space? This complex has security right around, it’s a huge complex. All of the gates shut down after hours. We still have an opportunity to be here and there’s someone here 24/7. That includes the technical maintenance and security. Plus we have cameras here and temperature sensors which we have access to via our phones, so if anything happens here even if we’re off site we are still notified immediately. What about insurance? You’d mentioned the possibility of fire and I know in China a big mining operation was wiped out by a flood. So if there was some extraordinary event here what happens to investors funds? The investor’s equipment definitely will be insured and will actually be in a different area. So it shouldn’t be affected in any way. What do you see as the biggest risk to the business? I know you’d expect it to succeed but what risks are there? The price of Bitcoin is the obvious one as that’s very hard to predict, especially short-term. So the biggest risk is definitely the fluctuating price of Bitcoin. Nobody knows what the big guys are playing with and how they’re going to turn it around. I do know that many big companies are preparing better equipment. Bitmain aren’t the only ones, there are now many other companies trying to do it differently and better. We don’t have any equipment now in our hands to test it, but when we do it should be better than what we currently have. That is why at this stage this is the best way to jump in. We are not stopping here. We want to invest more money in equipment to help ourselves and investors. We spoke briefly about colocation services, so why did you think that was not the way to go? Probably because we have done it our way to build everything here and I don’t think colcation is a very good service. It is not our business model and not something we are thinking about. Because if you think about colocation you need to build a much more expensive server room with a massive investment. That may work better in terms of security and so on, but we have done it a different way. We have done it to make mining profitable, not to have a shiny fancy data centre. So that’s why we have decided we’re not interested in colocation. Right now for your investor offer it’s like you’re buying Bitcoin for $5000 USD and that will be delivered in instalments over a 12-18 month period. The risk from the investor’s side is if anything was to go wrong here, but you have touched on insurance and security. What would happen if the Bitcoin price doubled in the next week – would you change the entry price of $5000 for investors? No. Our pay-rate and the price we get a Bitcoin for is not going to change. The exchange price for a Bitcoin will change but that doesn’t affect our operations. The number of Bitcoins we mine still stay the same as will our power costs here. The investor will be happy as they have already made good money. If Bitcoin hits $10,000 tomorrow I think our offer stays the same but we will just get more interest from investors. We will still keep the $5000 available as a fixed price, but again we have only $500,000 capacity for what we can take on. If someone offers us that amount in full tomorrow, that’s it and this offer is removed from the market. But then you will have more capacity down the track at some stage? We will have more capacity but we won’t take on more investors as that would be too much risk for us. We’d build and invest more of our own money because if Bitcoin is $10,000 it is more interesting for us to invest more. We do have money. We are not desperately looking for money, we’re just interested in sharing our risk. It’s probably not relevant for the duration of this agreement, but what do you expect to happen in 2020 for the next halving? We don’t think about it yet. We’ve developed this project and built this facility trying to predict what happens for the next 18-24 months. That’s it. No more than that. Is there anything else you think a potential investor should know? Just give us a call and arrange a visit. Come here like you have and if you sit down and understand that we have tried to save money in smart ways. We have excellent equipment, but outside of that we’re not worried about fancy carpet or any of that stuff. This mining operation should continue to make money. This is the strategy we’re after. So come and see us. And if they’re not in Melbourne they should just give you a call? Yes there is a phone number and email address on the site. We’d love to hear from you. Note: None of the information in this interview or anywhere else on this website should be considered financial advice. You must Do Your Own Research and get your own financial and legal advice. Cryptocurrencies have a history of volatility and Ultimate Money is not responsible for any financial losses or gains you may have when investing in any crypto coins or related projects.